Professional Healthcare Services’ (PHS) goal is to provide high quality compassionate care for the elderly and/or disabled. PHS is concerned with individual families and family relationships. We are partners with our clients and their families in staying focused on keeping people at home with competent and capable assistance. Home care and staying at home is our objective and as your partner we provide all the services necessary to address that goal. Professional Healthcare Services’ (PHS) goal is a focus on patient independence and to enable our clients to remain in their own homes. 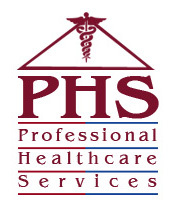 PHS provides Skilled Nursing services post hospitalization, post surgery, or for those facing a health care diagnosis requiring a change in lifestyle. Our primary goal is to provide professional, compassionate quality care and, at the same time, do this in a fashion which insures maximum independence, self respect, and dignity in a non institutional setting. Our focus on home and home health care is unconditional as we know the value of one’s own surrounding and its’ familiarity and comforts. “There’s no place like home”. We do all of this while constantly being aware of individual needs and desires and staying focused on compassion which is the bedrock for all healthcare! PHS also offers information, education and support to families caring for loved ones especially those coping with Alzheimer’s disease, related dementia, and other chronic illnesses. This support may take the form of respite care, support groups and other services.